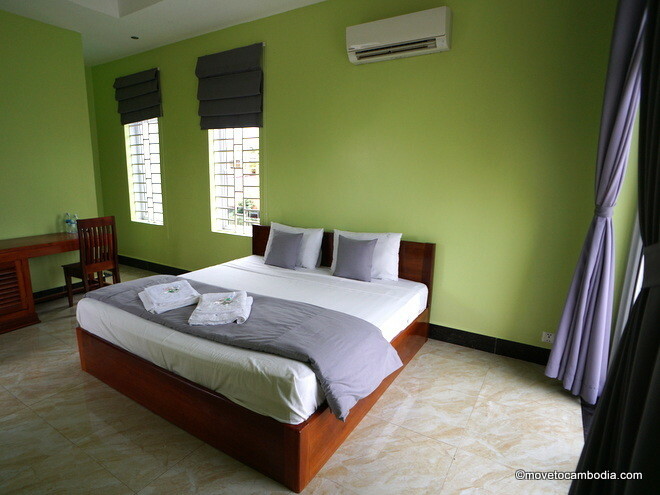 The Blue Buddha is a stylish, inexpensive Kampot retreat in the center of town. The Blue Buddha Hotel in Kampot gets rave reviews. After a recent stay there, we can see why. This modern hotel offers great value for money with stylish inexpensive rooms that are sparkling clean and freshly painted. Located just on the Salt Workers roundabout, the hotel is walking distance from the riverside and central Kampot. 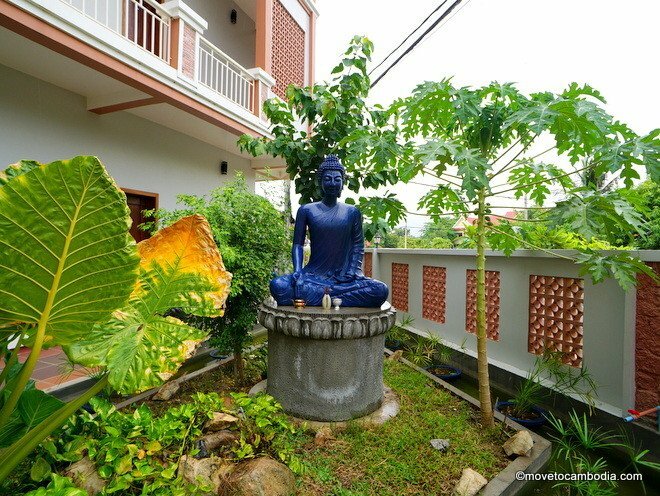 The Blue Buddha is a centrally located hotel in the heart of Kampot. The hotel has a 24-hour front desk and the staff were incredibly friendly and helpful, giving us lots of good suggestions. They also sell a range of locally made Bodia spa products in the lobby. The are four types of rooms: double, twin, large twin, and family. Double rooms have either a queen- or king-sized bed, while twin rooms have a double bed plus a single bed and can sleep up to three people. The large twin rooms have two double beds and can accommodate four people, and the family room sleeps up to five, with one king bed, one double bed, and one single bed. The double and twin rooms have a small balcony. Purple and green? Somehow it works. All rooms have air-conditioning, a flat-screen television, ensuite bathroom with solar-powered hot water, a desk, and a wooden wardrobe. Our room was freshly painted pistachio green, with purple curtains and lavender accent pillows on the big white bed. This may sound like a strange color scheme, but in this sunny room it really worked. The room was spotlessly clean and very tidily arranged — not a given at this price point — and toothbrushes, soap, etc., were provided for guests. Perhaps the best feature was the comfy mattresses, which they’ve imported from abroad. The hotel does not have a restaurant, but it’s within walking distance (or a $1 tuk tuk ride) of the many excellent eateries around Kampot’s riverside. 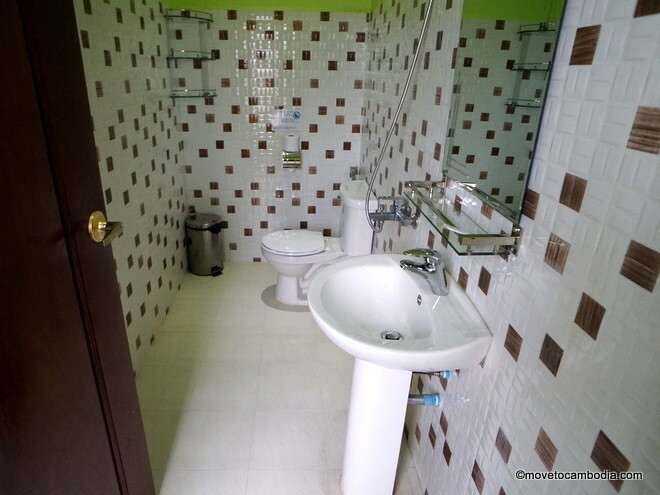 A pristine bathroom at the Blue Buddha Hotel. Our only complaint was that although our room had a balcony, there were no chairs on it to sit and enjoy the view of the roundabout, which offers hours of fun watching local drivers swerving wildly around it. Bookings are available online, either through their site or on Booking.com or Agoda. If you make your reservation on Booking.com they offer free cancellations and payment on arrival. → Check prices and book a room at Blue Buddha Hotel on Booking.com or Agoda now.